The green frog is the second largest frog in Minnesota, second only to the bullfrog. Don't let its name fool you--some green frogs are actually brown, bronze, or bluish instead of green. General description: This fist-sized frog has two ridges down its back. The young may have black spots. The males have large tympanums (the round structures directly behind the eye). 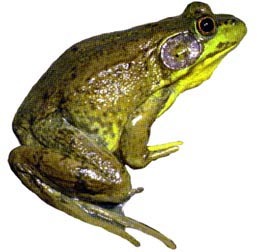 Color: Coloration is similar to the bullfrog but may be more brown than green. Unlike bullfrogs, the dorsolateral fold is typically present in green frogs. Usually there is dark mottling under legs and head. Skin is smooth or finely granular. Sounds: A throaty gunk or boink, like the pluck of a loose banjo string. Often calls during day and night. The male has paired vocal pouches. Males set up territories in shallow water of lakes, ponds, ditches or streams. Females lay up to 3,000 to 4,000 eggs in May through July. Eggs hatch in three to seven days. Tadpoles are green with black dots. Most of the young overwinter as tadpoles, then develop into frogs the next summer. Maturity is reached in two years after transformation. Green frog tadpoles eat mainly diatoms and algae. Adults eat insects, worms, and occasionally small frogs and fish. Rather than chase their prey, they sit and eat whatever comes by. Breeding habitat: Breeds in permanent bodies of water. Summer habitat: This highly aquatic species is often associated with streams and ditches, although it also inhabits shallow water of lakes and ponds. Winter habitat: Aquatic, often in streams and ditches. Green frogs have no special status in Minnesota. Like other frogs, green frogs have well developed senses. Their bulging eyes allow them to see in many directions. The round spot behind the eye, called the tympanum, or eardrum, is used for hearing. This specialized patch of tissue vibrates when sound waves hit it. The vibrations are then interpreted as sound by the frog's brain.